So here we are again at the end of another week and that means another look back at the last seven days in TV. 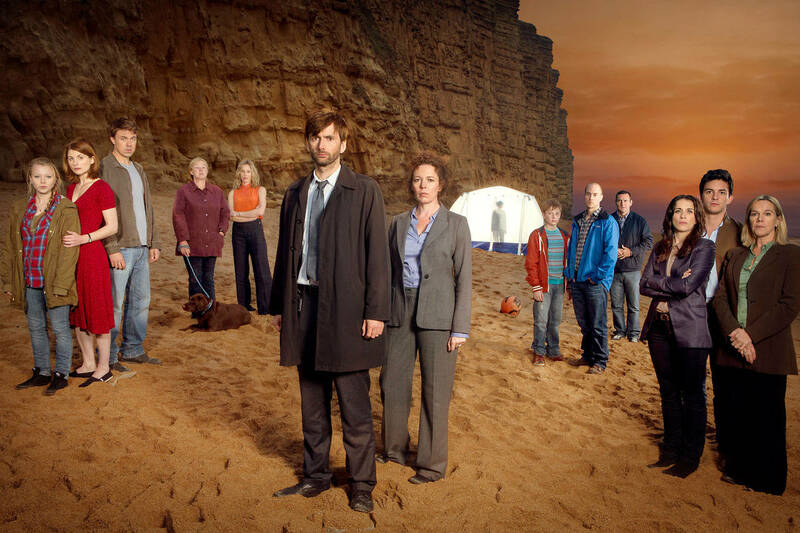 Monday saw the biggest TV drama event of the year so far with the final episode of Broadchurch. For the past eight weeks everybody has been speculating to who killed eleven year old Danny Latimer and even taking bets on the outcome. Surprisingly we got the answer fairly early on as Joe Miller (Matthew Gravelle) was revealed to be Danny’s killer. Via flashbacks we saw that Joe had been having an intimate relationship with Danny as they would meet in the beach hut and hug. Joe had also bought Danny his new phone and given him the £500 as a way to buy his silence. However on the night of his murder, Danny threatened to reveal he and Joe’s relationship once again. After almost jumping from the cliff, Joe talked Danny down only to accidentally choke him to death. From there all of the current evidence was shown from Susan (Pauline Quirke) spotting Joe on the beach to Lucy (Tanya Franks) noticing him throwing clothes into a bin. Obviously Joe’s revelation leaves his police detective Ellie (Olivia Colman) completely heart-broken and wonders if she ever truly knew the man she married. The news also ostracises Ellie from the rest of the community with Danny’s mother Beth (Jodie Whitaker) wondering how Ellie could not know what her husband was up to. Meanwhile Danny’s dad Mark (Andrew Buchan) goes to the police cell to confront Joe only to see a broken man looking back at him. The programme ended with Ellie and Hardy (David Tennant) both realising that their police careers were over, while the Latimer family attempted to move on with their lives. 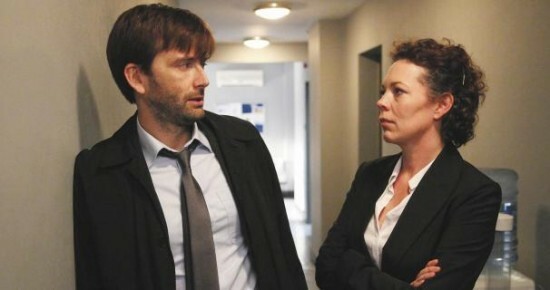 However the final shock was the announcement that Broadchurch will return for a second series. While the final episode of Broadchurch may have let some people down, I personally found it to be a fitting end. The fact that Joe was the killer didn't spoil the show for me as sometimes the logical choice is the way to go. I also didn't feel that Broadchurch was the kind of show that particularly needed a big twist. Instead the reveal of Joe's guilt and Ellie's subsequent emotional turmoil were the perfect end to a show which has relied on character just as much a plot. Sure there were a few far-fetched moments, Mark confronting Joe in his cell didn't sit too well with some, but overall I was gripped throughout the finale. However I'm still not sure about how this second series will work. With Hardy and Miller both out of the police force and the other characters getting on with their own lives, it's hard to know where Chris Chibnall will take his story next. But I almost feel if the reputation of Broadchurch will be slightly tarnished by a second series which I feel is being made purely because of the success of series one. However I cannot say a bad word about Broadchurch series one which has captivated me from beginning till end. Broadchurch is definitely a show that lived up to the hype and deserves to be remembered as one of the best shows of 2013. However David Tennant fans need not fret as he returned later in the week in The Politician's Husband. Here Tennant stars as government minister Alec Hoynes who attempts to make a leadership bid by resigning over his issues stemming from the prime minister's stance on immigration. But Hoynes is bid is ultimately unsuccessful after he is doubled-crossed by supposed best friend Bruce (Ed Stoppard). After becoming a back-bencher Hoynes is reduced to listening to the worries of his local constituents and spending much more time at home. Meanwhile Aiden's junior minister wife Freya (Emily Watson) finally has the chance to shine after her husband's exit from government. Freya's role up to now has been as Aiden's rock but she is given the surprising opportunity to fulfil her own government ambitions. This happens when Chief Whip Marcus Brock (Roger Allam) offers Freya a position in the cabinet on the proviso that she publicly disagree with Aiden's thoughts on immigration. Though she thinks about turning the position down, Aiden convinces her to take the job and bring down Bruce's scheming from the inside. But it appears as if Freya has her own ideas and now that she has been given the chance to shine in the spotlight she won't let her husband ruin things. By the end of episode one, Freya has already ignored Aiden's plan and has seemingly gone into business for herself. I feel that when people see politics in the title of a drama it instantly puts them off. However I feel that The Politician's Wife has a lot more to offer than simply being another government thriller. Indeed I was more invested in the scenes set around the Hoynes' marriage. The fact that the couple also have a son who suffers from Asperger's Syndrome also adds an extra element to the drama. Indeed it is clear how much time Freya has spent with Noah (Oscar Kennedy) as compared to her husband. The scenes involving Noah and Aiden are incredibly tense and it seems as if Aiden finds it difficult to come to terms with his son's condition. I believe that writer Paula Milne is completely at home when writing about the Hoynes family and how the change of power in the marriage has affected their home life. I feel Milne is less comfortable writing the political dialogue and there are some lines in these scenes that feel incredibly clunky. Thankfully there is a tremendous ensemble cast that are able to pull some of the more questionable lines. 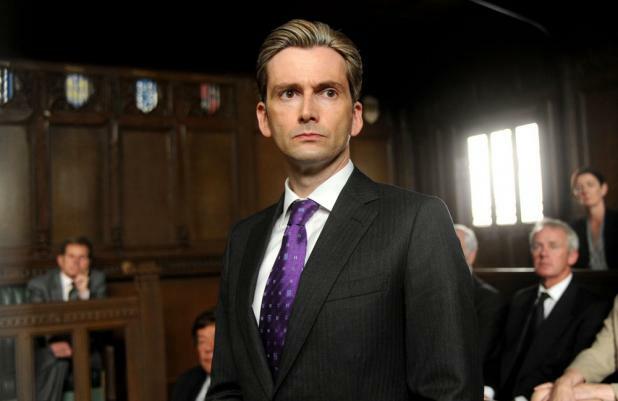 David Tennant's ambitious and conniving Aiden is a million miles away from Broadchurch's Hardy. 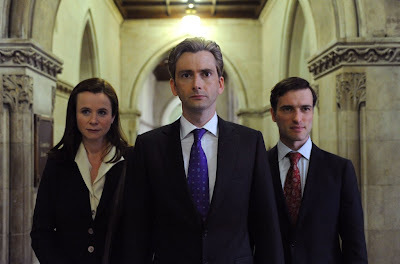 Indeed Tennant proves what a versatile actor he is as he is both commanding in the early political scenes and also tender when trying to interact with his son. Emily Watson is predictably brilliant as we see Freya turn from doting wife to political animal in the course of about 45 minutes. Also worthy of praise is young Oscar Kennedy who I found completely engrossing as the troubled Noah. The only member of the cast who troubled me was Roger Allam as his association with The Thick of It meant that I struggled to take him seriously. While The Politician's Husband is somewhat poorly scripted, I feel it has a lot to offer in terms of themes and characters. The central performances are totally brilliant and this is definitely a drama that shows promise. Two new comedies also debuted this week; however I am playing fast and loose with the term comedy. That is because new BBC sitcom The Wright Way failed to make me titter even once. The programme focuses on Health and Safety Officer Gerald Wright (David Haig) who is seemingly troubled by every aspect of modern life. Gerald lives with his daughter Susan (Joanne Matthews) and her lesbian partner Victoria (Beattie Edmonson) while his wife left him after an argument involving Marmite. Everything about life seems to trouble Gerald from the length of time Victoria spends in the bathroom to the fact that shop assistants are consistently rude to him. Meanwhile at work he oversees a small group of misfits including the lecherous Bernard (Toby Longworth), chubby dimwit Clive (Luke Gell) and Malika (Mina Amwar) who is seemingly turned on by road closures. The fact that the big gag in the first episode involves a mix-up with receipts and some underwear tells you all you need to know about The Wright Way. It's surprising then that it's written by Ben Elton who was so cutting edge in the 1980s and brought as the brilliant Blackadder. While watching The Wright Way I kept thinking that the Ben Elton from the 1980s would've made fun of this sitcom had it aired during that decade. As it is the programme seems to be a cheaper form of therapy for Elton as he uses Gerald to complain about the aspects of modern life that irk him the most. Haig is a fine comic presence but even he can't pull off the dodgy dialogue he's given here, including lines about women taking too long in the toilet that is taken straight from the 1970s. The Wright Way didn't appear to have many redeemable qualities and lacked any laughs at all but at least it gives Elton a forum to air his grievances about the world. I just wish he could make his observations a lot funnier than he has in his woeful new sitcom. Finally this week we have the return of a programme that owes a bit of gratitude to Elton and his alternative comedy friends. Now in its third series, 10 o'clock Live reunites Jimmy Carr, David Mitchell, Lauren Laverne and Charlie Brooker for another topical look at the week's news. I say topical, but most of the jokes were aimed either at Margaret Thatcher's funeral or the hunt for the Boston bombers events which both happened last week. On the positive side Charlie Brooker's still has segment in which he rants about the American news while I also don't mind Jimmy Carr's opening segment even if it is basically what he does on 8 Out of 10 Cats. However this is where the praise ends as this opening episode was full of annoying bits and jokes that felt incredibly dated. For example there was a whole sketch involving the promotion of Margaret Thatcher the musical which starred Les Dennis in the lead role. Meanwhile Mitchell's weekly interview segment, which was about wealth or something like that, was one of the most annoying things on TV this year as it basically turned into a scrap between irritating journalist Owen Jones and Apprentice reject Katie Hopkins. The audience also wound me up as they wouldn't stop cheering at the top of the show and began booing like maniacs when Hopkins started ranting about the state of the economy. Lauren Laverne's role seems to have been decreased this series and her main function is now to ask the men about their opinions. Overall it appears as if nobody thought they were going to get a series 3 and now they are trying to sabotage the show so it won't get a fourth run. It's a shame because I like Mitchell, Brooker and Laverne and feel to an extent their talents are squandered on this poorly executed topical news comedy which should be a lot better than it is.